The AppMon Server Health dashboard displays the overall health status of your AppMon deployment. It shows the most important performance indicators which help you run a AppMon deployment successfully. This information is valuable to testing teams as they monitor and tune a system, and to production operations teams for continual deployment optimization. Most charts show average and maximum values, which you can use to differentiate normal loads and spikes. CPU Usage / GC Sum: The left axis shows the percentage of CPU usage for processes (maximum and average aggregation). The right axis shows the amount of suspension time caused by garbage collection, and the maximum CPU consumption on the Server. Total Measures: Shows the total number of defined Business and non-Business measures, and the percentage of time spent writing measurements to the Performance Warehouse. For real time sessions only, this tile also shows the size of the internal real time analysis and cyclic event queues, and the number of measurements handled by the time series center per second. Agents: The average and maximum number of connected agents. Connected Systems: The average number of connected collectors, agents, and clients. Memory Usage / PurePath Buffer Size: The average and maximum memory that the Server consumes. If you exceed the free memory allocation, Garbage Collection suspensions occur. You can see these in the Suspension Time and Suspension Count graphs. also shows the average and maximum number of PurePaths kept in memory. Active Visits: Summarizes UEM visit activity, showing the total number of active visits in all VisitStores, and the number of processed actions and number of mobile actions. PurePath Length: The average and maximum number of nodes in a PurePath. Based on your environment, the average PurePath length should not exceed 300 for production, 500 for test center, and 1000 for development. The impact of long PurePaths include higher CPU load on the monitored application or on the Server with higher MPS numbers, and shorter live session due to an implicated higher MPS. Communication Traffic in MB/10s / GC avg: The average and maximum traffic volume on the Server. A network overload trend indicates that you should reduce the amount of data that your AppMon configuration captures. Storage Queue Saturation: The maximum and average storage utilization as a percentage of the total storage queue. A warning alert occurs at 80% utilization and a severe alert at 90% utilization. Transactions/s: The average and maximum number of transactions per second for all agents. Transactions/s (PurePath): The average and maximum number of PurePath transactions per second for all agents. Realtime and Host Queue Saturation / GC Max: The left axis shows percentage of total utilzation (average and maximum) for the real-time analyzer. The right axis shows the duration of suspensions caused by garbage collections. in efficiently configured deployments, the AppMon Collector does not have major garbage collections. Recorded PurePaths: The number of PurePaths written to session storage from the in-memory live session. Unrecorded PurePaths: The number of PurePaths that could not be written to the session storage from the in-memory live session. 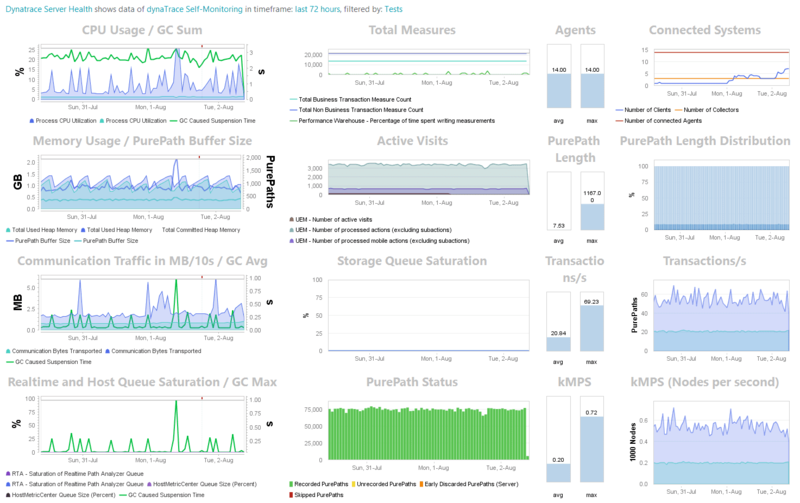 RTA - Analyzed PurePaths: (realtime sessions only) The number of complete PurePaths that the real-time analyzer processes. Under certain circumstances (high load, low PurePath buffer size), completed PurePaths may fall out of the queue before analysis. Skipped PurePaths: The number of PurePaths that do not get analyzed due to missing events such as not arriving in time. Early Discarded PurePaths: The number of Purepaths discarded early in the processing chain, prior to completion. This could be due to a number of factors, including full queues or processing buffers, invalid start/end dates, age expiration, and low server memory. kMPS: The average and maximum number (x 1000) of measure nodes per second.